Cuisine-wise , New Majestic offers something like Peach Garden, Modern Chinese Cuisine. I like how traditonal Chinese dishes are given a twist with different ingredients. Makes it a whole lot more interesting and exciting! 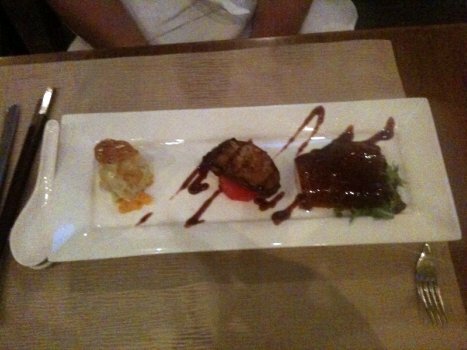 True to their word, the restaurant’s specialities didn’t disappoint. The combination of crispy wasabi prawn, peking duck and pan-seared foie gras is getting far too common (had almost the same trio in taste paradise before and they were also on our set menu when we ate in peach gardens awhile back). Nonetheless they were all executed very well. Peking duck had that crispy skin that was so moreish. Their grilled rack of lamb in chinese honey with pan-fried carrot cake is another dish you must try. Lamb was tender, without the gamey taste thanks to the honey marinade. Carrot cake was soft and fluffy, but I’m still loving Taste Paradise’s XO Carrot Cake just a little more. 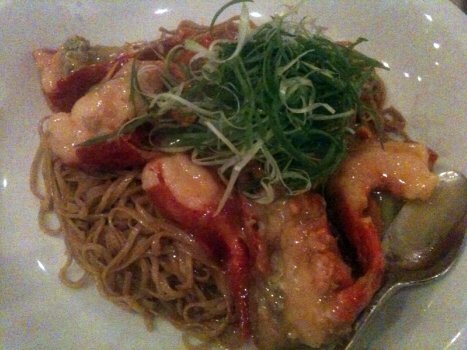 Don’t bother ordering the usual boston lobster with stewed noodles from the ala carte menu because you can get exactly the same thing with their boston lobster promotion! Of course, you can choose to do your boston lobster with any style of your choice but to miss out on this dish would be crazy. The noodles were al dente and soaked up all that delicious lobster sauce. Very yummy, and all for $50. What a deal! Just let your waiter know. In fact, they’ll probably let tell you about this option, like in our case. To end off the meal, get the crispy durian ice cream or the crispy chempadak ice cream. The batter has no oil residue, and yes the ice cream inside is still frozen. Throw all that dining ettiquette aside because eating this can get quite messy. The hotel itself has an eclectic mix of furniture; we had quite a lot of fun in the lobby 😉 Reservations are a must, and they have two sittings so don’t be surprised if they ask you to foot the bill straight after you are done. I was quite offended by that because they didn’t tell us this when we made our reservation. Oh well, they are running a business I guess.